I'll have to be short and sweet today, but I've got two fun photos to share. As I mentioned, we've got Operation Paint Project going on here at our house. It will be a three stage process over the next few weeks: 1) the kitchen cabinets, 2) the breakfast room and 3) the adjoining dining room. Today, I've got a fun before and after of Part One- the kitchen cabinet makeover! Phew. No one told me how difficult it is to paint cabinets! I'm hoping that it will make painting the walls a breeze, in comparison. And it makes it really difficult when you are painting cabinets lime green! Ha. Only kidding. We actually took the cabinets from a dingy, off-white beige to a stark, bright white. Ready for the big reveal? Voila! Here's the not-so-white before (if only the picture could capture how dingy/yucky/not crisp and clean this color really is!). Very nice! Your kitchen looks very open now! Wanna come paint my cabinets now? haha. What a great transformation! I can see a little bit of difference in the cabinets but that paint color is fantastic! Totally transformed the room! I think all your hard work paid off. Looks great! It's looks amazing!!! Love the grey!!! Gorgeous! I love a white kitchen!! Looks amazing! How was I not a follower before?!? I am now! You did such a great job. We painted cabinets in our townhome and it was soooooooo much work. Kudos to you. beautiful. You are making me sooooooooooooo jealous with this kitchen makeover. The crisp white is perfect and the white/grey combo is even perfect-er (that really is a word). My linoleum floors and original paint-chipped '50's cabinets are hideous. Did I mention that I am sooooo jealous? They look great and I love the gray. your kitchen looks great! I'm in the process of painting my cabinets. Holy cow! It looks soooo good. And I'm a big fan of gray- soothing but not boring like beige can be sometimes. You must loooove it!! Nice color choice. Your kitchen looks so fresh now. You have such a classic kitchen, you lucky duck! The color is a huge change, I am sure! So beautiful Michelle!! It's a huge difference. I've heard painting cabinets is pretty tedious and looks like y'all pulled it off perfectly! 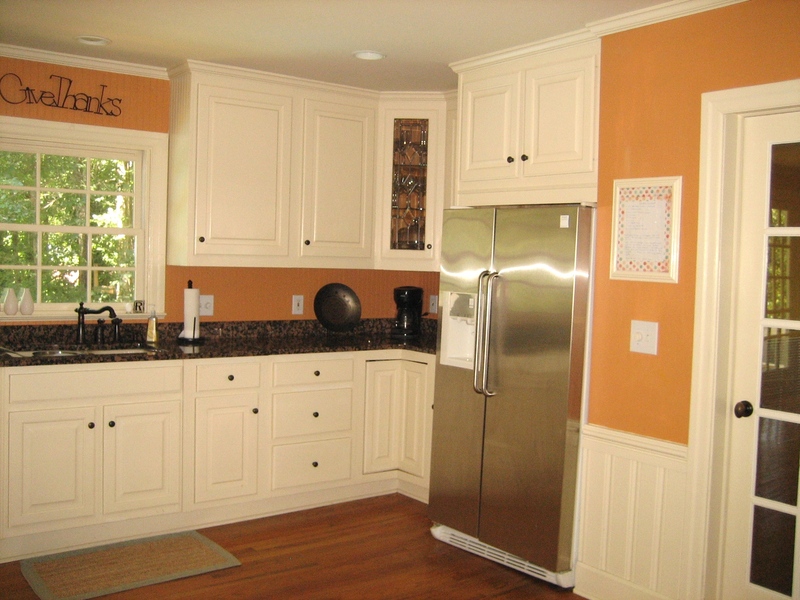 What paint did you use for your cabinets?!? !